This firearm warranty is good only to the ORIGINAL OWNER who has registered his ownership with The Marlin Firearms Company at 100 Kenna Drive, North Haven, Connecticut. WARRANTY and CERTIFICATE OF OWNERSHIP card must be completed and mailed to The Marlin Firearms Company at the above address WITHIN TEN (10) DAYS of purchase to Insure the protection of the warranty. NOTICE of defect in materials and/or workmanship must be received by the company WITHIN FIVE (5) YEARS from the date of purchase. Normal wear, or damage resulting from neglect, abuse, alteration, or repairs not made or authorized by The Marlin Firearms Company or use of non-Marlin parts are not covered by the warranty. 1. After notice of defect in material and/or workmanship is received by The Marlin Firearms Company, Marlin shall send instructions for shipment of the firearm; and repairs will be made and the firearm returned within a reasonable time after the firearm is received. Cost of shipping, insurance charges, etc. involved in returning the firearm to the company shall be prepaid by the original owner. 2. Cost of parts and labor performed shall be provided without charge by The Marlin Firearms Company. 3. If The Marlin Firearms Company, after receipt of the firearm, determines that the defects in material and/or workmanship were the result of abuse and/or neglect, or otherwise not covered by the warranty set forth above, Marlin shall notify such owner to that effect and give an estimate for repair. In such cases, repair, return shipping and insurance charges, etc. shall be paid by such owner. If feasible, will be made through the store of purchase. 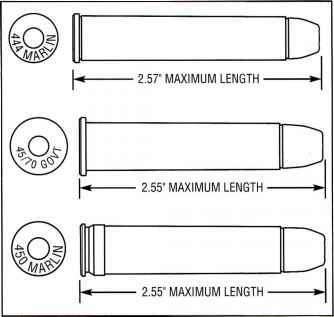 NOTE: If your rifle is chambered for 444 Marlin, 45/70 Gov't, or 450 Marlin, please note the following warning and dimensions. •WARNING: The cartridges shown below, actual size, indicate Industry Standard 444 Marlin, 45/70 Gov't and 450 Marlin dimensions. 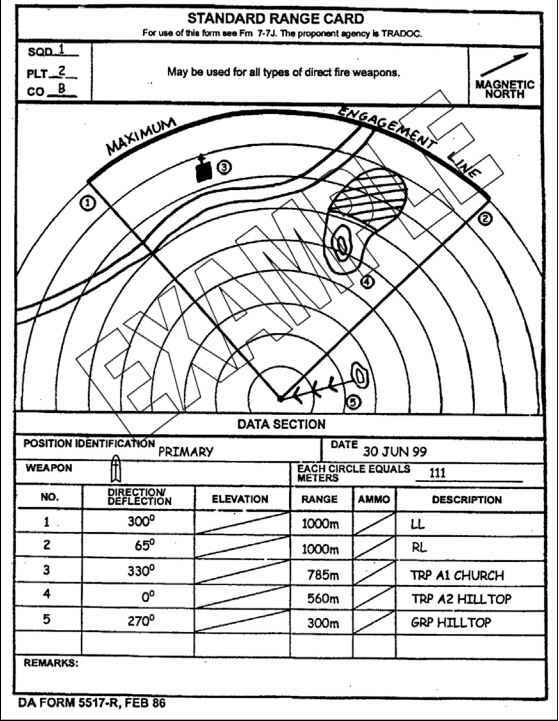 Use of ammunition that does not comply with these dimensions could cause personal injury and damage to the rifle. It is very important that you read and understand this manual before using your firearm. Warnings should be read and heeded carefully. Also follow "Marlin's Guide to Gun Safety," printed in this manual. •WARNING: Marlin firearms are designed and manufactured to handle standard factory-loaded ammunition which conforms to SAAMI (Sporting Arms and Ammunition Manufacturers' Institute Inc.) standards with dependability and safety. Due to the many bullet and load options available, the element of judgement involved, the skill required, and the fact that serious injuries have resulted from dangerous handloads, Marlin does not make any recommendations with regard to hand-loaded ammunition. •WARNING: It is a violation of federal law to alter or deface the serial number of any firearm. •WARNING: Only use the offset hammer spur on the gun with which it was packed. It will not fasten securely on narrower (1A") Marlin or Glenfield hammers, or other hammers, and could cause a dangerous situation. Because of its solid top, side ejecting receiver, your rifle is ideally suited for use with a scope. The receiver is drilled and tapped for scope mounting. However, once mounted, most scope and mount combinations do not allow sufficient clearance for your thumb between the eyepiece and hammer for safe operation. In order to operate the hammer safely, we recommend that you use the offset hammer spur packed with your rifle, when using a scope. A Vie" hexagonal wrench for attaching the spur is also included. What is the WARRENTRY ON MARLIN RIFLES?